House of the Week: $1.2 million for a Cabbagetown townhouse with a Hollywood pedigree – "I KNOW TORONTO!" Here’s your chance to own a heritage property in Cabbagetown once lived in by Walter Huston. Although the home has been fully renovated, they kept some of the original touches like the front door with stained glass. Five bedrooms, but only two bathrooms. 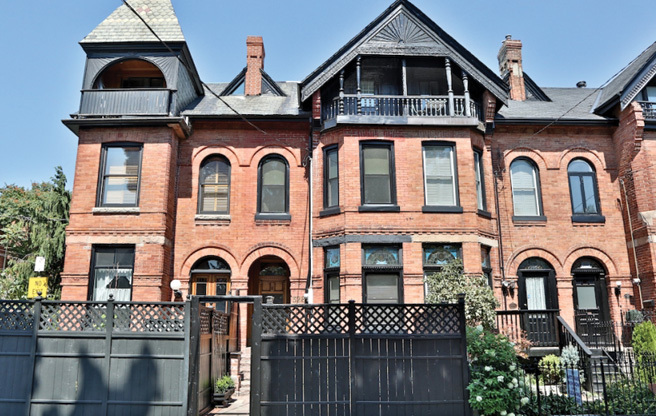 THE PLACE: A five-bedroom Cabbagetown row house with a fully finished basement and a 123-year history. BRAGGING RIGHTS: This home is the start of a game of six degrees of Kevin Bacon. Built between 1889 and 1890, it was once lived in by Walter Huston. Walter was an actor who sired a generation of Hollywood stars, including John Huston, director of films like The African Queen and The Maltese Falcon. John, in turn, is Angelica Huston’s father. She was in Frances with Kevin Costner, who was in JFK with Kevin Bacon. Voila. BIG SELLING POINT: The current owners did a complete renovation on this heritage property but kept pieces of historic significance, like the hefty front door and the beautiful stained glass in the main living room and back entrance. POTENTIAL DEAL BREAKER: With only two bathrooms, the kids are going to have to share. You may have to mediate arguments if they’re prone to extra-long showers. NextFive things to do in Toronto this weekend!